WindowsTool is a fake piece of software which has been created by hackers to try and make you buy the fake upgrade to the infection that you have on your computer. We’ve found that although WindowsTool may look legitimate, it’s a complete scam and should be removed in the most effective way possible. The good news is that you can actually get rid of this infection very easily – by using the steps outlined on this website. 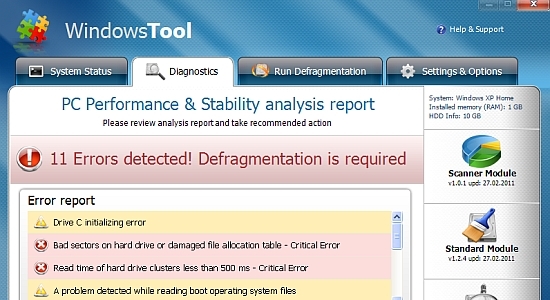 WindowsTool is what’s called a “malware” (malicious software) program. It has been created to get you to buy the rogue upgrade to the software, which it does by showing you a number of false virus scanning results. To get rid of the virus, you have to be able to stop the program from running as well as then making sure that you’re able to fix the various issues that it will have placed onto your system. The main characteristic of this infection is that it’s continually going to be showing you a number of false scanning results in an attempt to get you to buy the fake upgrade to the program. This can only be fixed by first ensuring that you can stop the program from running before deleting it completely, with either a manual removal method or by using a special spyware removal tool.